Jesus was not made in God's image since he was not made or created. He was and is forever. He is the first and the last, the alpha and the omega. Jesus is the Son of God. Yet scripture says that Jesus is the image of God. 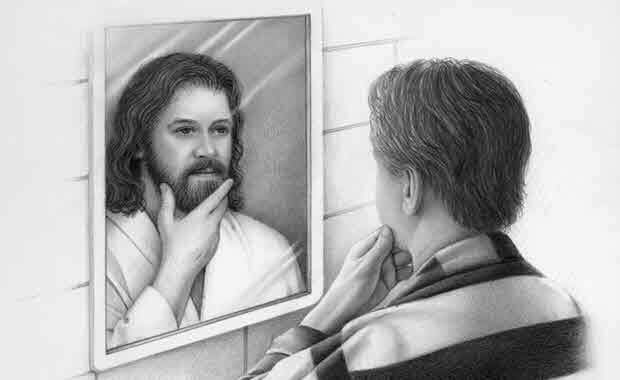 We as Christians, followers of Christ and in Christ, are to reflect Christ - thus bear His image or more to the point we are image bearers for God and Christ. We are God's representatives on earth while He is not here. He [Jesus Christ] is the image of the invisible God, the firstborn of all creation. Just as we have borne the image of the man of dust, we shall also bear the image of the man of heaven. Most Common Translation is "Man in God's Image"
Possibly More Accurate Translation is "Man as God's Image Bearer"
So God created man as his image bearer, as God's image bearer he created him; male and female he created them. The “ beth of essence ( beth essentiae ) or equivalence” (Joüon and Muraoka, A Grammar of Biblical Hebrew , 2: 487 ). The “ beth of identity” (Waltke and O’Connor, An Introduction to Biblical Hebrew Syntax , 198 ). The “ beth of predication” (Gordon, “ ‘In’ of Predication or Equivalence,” 612 – 13 ). Every human, regardless of the stage of development, is an imager of God. There is no incremental or partial of the image via some ability, physical or spiritual. No member of the animal kingdom, regardless of any cognitive ability it might have, is an imager of God. The same goes for any intelligent life form, artificial or the hypothetical extraterrestrial. This understanding lends clarity to the Old Testament passages. Being created as God’s imagers means we are His representatives on earth — the only qualification for this is that we are human. This is why the creation of humankind as God’s image in Gen 1:26–27 is immediately followed by the so - called dominion mandate of Gen 1:28. Humanity is tasked with stewarding God’s creation as though God were physically present to undertake the duty himself. Genesis 9:6 ’s requirement of capital punishment for murder is because the intentional killing of an innocent human was tantamount to killing God in effigy. Clines argument with respect to Gen 5:1–3 is also brought into sharper focus: “Seth is not Adam’s image, but only like Adam’s shape” (Clines, “The Image of God in Man,” 78n117 ). Seth resembled Adam, but he was not Adam’s representative on earth. The prepositional changes in Gen 5 serve to distinguish the point of Gen 1:26–27 from Gen 5:1–3 . This view means that all human endeavor and enterprise has spiritual meaning — work is a spiritual exercise. Vocation is worship, no matter how mundane. Any task performed to steward creation, to harness its power for God’s glory and the benefit of fellow imagers, and to foster in the harmonious productivity of fellow imagers, is imaging God. This application of the image has been referred to as the “cultural mandate” or the vocational view of the imago Dei (Sands, “The Imago Dei as a Vocation”). The functional view of the image described argues that the phrase means humans are created as God’s image. Taking that understanding to the New Testament’s image of God language brings the meaning and importance of the image doctrine in New Testament theology into clear focus. What does Genesis mean by man being made in the image of God? The bible indicates that my body, though not me, is integral to my humanity, which would be reduced without it. Scripture promises me resurrection. Plato thought I would be better off without a body, as many think today, but that is wrong. I have a mind, including a conscience; also feelings and desires, along with my powers of mental and physical action. Thus endowed, I read the Bible as God's Word, teaching me what I should think and do about this puzzling, complex reality that I know myself to be. Genesis 1:26-27 declares that God created mankind of both sexes, male and female, in his image and likeness. Image and likeness were once thought to express different things, but they mean about the same. This passage shows us, first, our unique and special dignity (God speaks of no creature other than man as his image-bearer), and, second, how we are meant to live. Image means representative likeness—which tells us at once that we should be reflecting, at our creaturely level, what Genesis 1 shows God is and does. Therefore we should always act with resourceful rationality and wise love, making and executing praiseworthy plans just as God did in creation. He generated value by producing what was truly good; so should we. We should be showing love and goodwill toward all other persons, as God did when he blessed Adam and Eve (1:28). And in fellowship with God, we should directly honor and obey him by the way we manage and care for that bit of the created order that he gives us to look after, according to his dominion mandate (26, 28). For us, then, as for Adam and Eve before the Fall, and for the Lord Jesus himself—the incarnate Son whom Paul hails as the Father's true image (2 Cor. 4:4; Col. 1:15)—being the image of God means actually living this way, moment by moment and day by day. But, like Adam and Eve and everyone else save Jesus, we fail here constantly, however good our intentions as believers. And so, in spades, do all unbelievers who, being under the power of the anti-God force Paul calls sin (Rom. 3:9), lack good intentions (Eph. 2:1-3, 4:17-24). That does not mean, of course, that they are all as bad as they could be; it simply means that sin in the human system, our legacy from Adam, drives us all the time to be self-centered and self-seeking, and so robs us of the power to love God with all our heart, mind, and strength. So a distinction has to be drawn. We still bear the image of God formally—that is, we still have in us the abilities that, if rightly harnessed, would achieve a fully righteous, Godlike life—and so the unique dignity of each human being must still be recognized and respected (Gen. 9:6; James 3:9), as a gesture of honor to our maker. But we have lost the image substantially, and it takes God's grace-gift of union with Christ to restore it fully. Through this gift we share his resurrection life in regeneration, sanctification, and glorification. Hereby we "put on the new self, created after the likeness of God in true righteousness and holiness" (Eph. 4:24), and are progressively transformed into the image of the Lord Jesus, "from one degree of glory to another" (2 Cor. 3:18). Thus the substantial image is renewed. God's work of restoring the image starts in the heart, with inward illumination, our embrace of Christ, and motivational change at the core of our being (2 Cor. 4:4, 6, 5:17). Born-again believers want God more than they want anything else. In daily life our strongest desire is to love and worship and serve and please and honor and glorify the Father and the Son, who saved us. Also, we find ourselves wanting to do good to others every way we can, and most of all to share with others our knowledge of new life with God in Christ. Thus all our duty becomes all our delight at the deepest level, and from our new motivation comes that imitation of God and of Christ that is every Christian's calling (1 Cor. 4:16; Eph. 5:1; 1 Thess. 1:6)—and which is precisely expressing the image of God in daily life. True imaging of God in Christlike action starts with the Christlike motivation of the regenerate, Spirit-indwelt heart. Two humans, living in God's image, were the crown of God's creation. Our fallen race, acting out the image of Satan, ruins his creation. A new humanity, the company of believers recreated in Christ's image, will adorn and enjoy the new heaven and earth that are promised. Praise God!